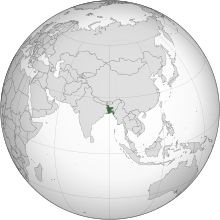 Bangladesh (pronounced /ˈbɑːŋɡlədɛʃ/ (deprecatit template) or /bæŋɡləˈdɛʃ/ ( listen); Bengali: বাংলাদেশ), offeecially the Fowkrepublic o Bangladesh (Bangla: গণপ্রজাতন্ত্রী বাংলাদেশ Gônoprojatontri Bangladesh) is a kintra in Sooth Asie. It is bordered bi Indie on aw sides except for a sma border wi Burma (Myanmar) tae the far sootheast an bi the Bay o Bengal tae the sooth. Thegither wi the Indian state o Wast Bengal, it makes up the ethno-linguistic region o Bengal. The name Bangladesh means "Kintra o Bengal" in the offeecial Bengali leid. ↑ "Article 3. The state language". The Constitution of the People's Republic of Bangladesh. bdlaws.minlaw.gov.bd. Ministry of Law, The People's Republic of Bangladesh. Retrieved 1 February 2017. ↑ Data Archived 4 September 2011 at the Wayback Machine..Census – Bangladesh Bureau of Statistics. ↑ 7.0 7.1 7.2 7.3 "Bangladesh". World Economic Outlook Database. IMF. This page wis last eeditit on 30 August 2017, at 01:50.